"It's ever so slightly spooky, you know"
Due to the restaurant Mr Monkey was going to not being there any more, he ended up wandering around a little bit. 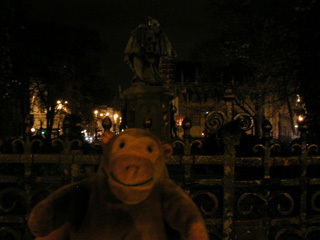 He found the Petit Sablon, a small garden full of statues, which is locked at night. 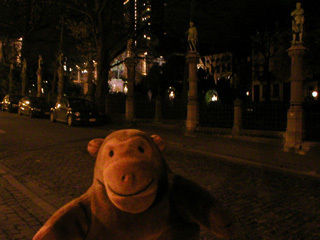 Mr Monkey walked around the outside, looking at the statues of medieval guildsmen, then ran off down the street.